cake | What's Cooking at the Genua's? Today’s recipe is supposed to be a dessert of some sorts. 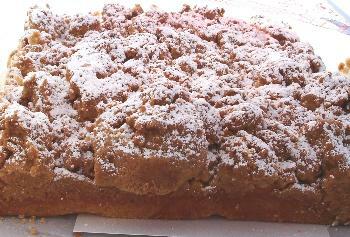 We all love desserts and this crumb cake recipe is one I love. What is the best part of crumb cake? The crumbs of course! And this recipe delivers! I was trying to remember who gave me the recipe and I believe it was my ex-mother-in-law Agnes Ruppel. I have made it a few times and it always turns out great. Easy to make and it won’t last long! It’s a great cake to bring to any occasion! Just be careful when eating it that you don’t inhale the powdered sugar! You know it’s happened to all of us at least once! 1: Sift together flour, baking powder and salt. 2: Cream sugar and butter until fluffy. Add beaten egg. 3: Add flour mixture and milk alternately, beating thoroughly. 4: Add vanilla. Spread mixture thinly over the greased bottom of your largest, edged sheet pan. 1: Mix dry ingredients, add butter and mix thoroughly. It will be lumpy. With your fingers crumble over top of cake. 2: Bake at 350 degrees for 30-35 minutes. Sprinkle powdered sugar on top when cool.